Full service for water sports and sales brokerage. Rent a luxury speedboat with crew and take practical lessons in sailing. With a view of De Spaanjerd, enjoy the fine white sandy beach free of cost. A beautiful sandy beach makes De Spaanjerd a wonderful family haven. 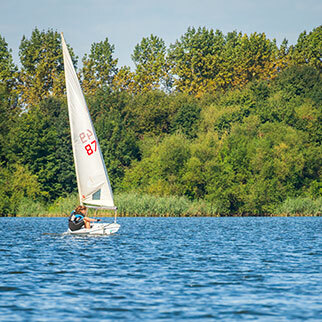 Aspiring water sports enthusiasts can sail, surf and take sailing courses. Even with no sailing licence or experience, you can sail these spacious, comfortable and, above all, quiet dinghies, fitted with electric motors. Are you interested in buying or selling a yacht? De Spaanjerd Marina has a quay for selling boats. While onboard, feel free to chat, mail or surf the web! Both Heerenlaak and De Spaanjerd are equipped with wireless internet (Wi-Fi). Aqua Libra Yachtcharter has a fleet of luxury yachts which you can sail.